Stunning Cape Panwa Phuket Home , Sumptuous villa - the best views money can buy in Phuket USD $2,500,000. 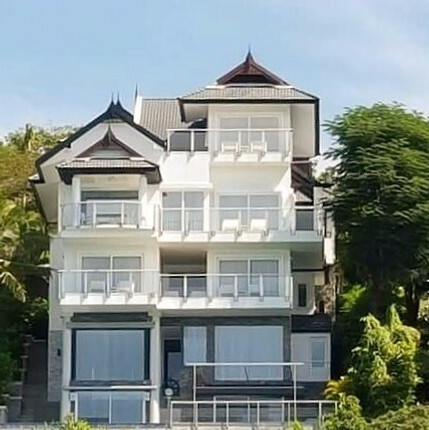 Vanich Bayfront Ville on Cape Panwa has to be one of the finest Villas on Phuket Island with 'front line' sea and island views across Ao Yon Bay that are simply stunning. This prestigious home has been renovated top to bottom with no expense spared. It is ready to walk into and start living. You will be afforded the best views available in Phuket from almost every room in the house. Located on the South West facing point of Cape Panwa this secluded property is only a few moments from the Cape Panwa Hotel and many other great restaurants and bars. The property is over 450 sq. metres (5,000 sq. feet) of built-in living space and features a magnificent large living and lounge and raised dining area, a brand new designer luxury kitchen, 4 large bedroom suites each with full bathrooms, a large music/tv room, fully equipped bar, sauna, steam room, extensive maids quarters and separate laundry facility and much more including 2 additional bathrooms and a separate pool deck shower area. There are 'wrap around' balconies on 3 floors and the views from every room in the property are magnificent. The property has its own water storage and treatment plant, full security and cctv systems, a large double garage, external storage, a beautiful pool deck with infinity pool and in-ground jacuzzi as well as a waterfall and garden features. This really is a truly wonderful home and has to be viewed to be fully appreciated.